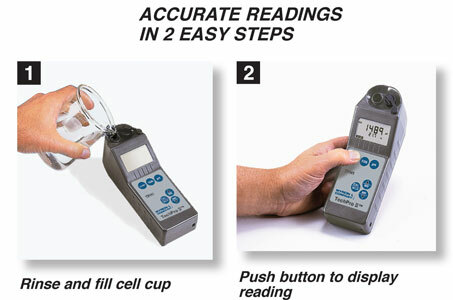 Myron L®’s 40-plus years experience designing and building quality conductivity, TDS and pH measuring instrumentation. The TechPro II is handheld, lightweight and simple to operate. Measuring conductivity, TDS, pH and temperature, the highly stable circuitry delivers the accurate readings needed to assure product quality, prevent equipment damage or verify inline instrumentation in a wide range of applications. The TPH1 and TH1 are designed with an internal pH sensor to prevent breakage and prolong the sensor’s useful life. The rugged, waterproof case on all three models protects the electronics of the instrument and fits comfortably in your hand. TechPro II also features auto shut-off to prolong battery life. Industrial and commercial users all over the world rely on Myron L®’s proven quality instruments for their water measurement needs. Dimensions 196 x 68 x 64mm / 7.7 x 2.7 x 2.5in. Weight 320 g / 11.2 oz. Cond / TDS Cell Capacity 5 ml / 0.2 oz. pH Sensor Well Capacity 1.2 ml / 0.04 oz. This hard protective carry case is a rugged all plastic foam-lined case that includes 2 oz. each pH 4, 7, & 10 Buffers, pH Sensor Storage Solution, and 442-3000 and KCl-7000. This hard protective carry case is a rugged, all plastic foam-lined case that includes 2 oz. each pH 4, 7 & 10 Buffers and pH Sensor Storage Solution. Small foam-lined protective carry case. Constructed of padded nylon and features a belt clip for hands-free mobility. Non-refillable KCI gel-filled combination pH sensor featuring a chemical resistant, porous liquid junction. All Myron L® Instruments are factory calibrated with Standard Solutions of known conductivity/TDS value and (when appropriate) with pH buffer values 4, 7, and 10. These solutions and buffers are traceable to the U.S. Government’s National Institute of Standards and Technology. Periodic recalibration with the appropriate Conductivity Standard Solution and pH Buffers will help maintain the accuracy of your instrument. All Myron L® TechPro II Instruments have a Two (2) Year Limited warranty, excluding the pH sensors, which have a Six (6) Month Limited warranty. warranty is limited to the repair or replacement of the TechPro II Instrument only, at our discretion. The Myron L® Company assumes no other responsibility or liability.